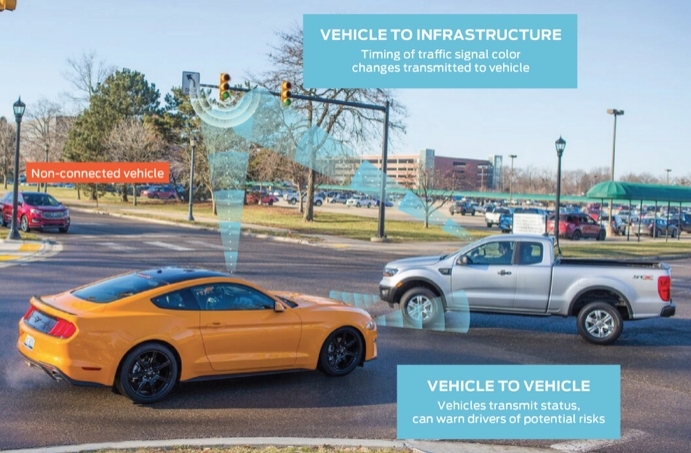 Ford Motor Co. plans to add its cellular vehicle-to-everything technology to all of its vehicles by 2022, allowing them to talk and listen for people, infrastructure, and similarly equipped vehicles. // Rendering Courtesy of Ford Motor Co.
Ford Motor Co. is all in when it comes to adopting Qualcomm’s 5G cellular vehicle-to-everything technology, saying it plans to add C-V2X to all of its vehicles by 2022 in a blog post written by Don Butler, executive director of Ford’s connected vehicle platform and product. C-V2X, or cellular vehicle-to-everything technology, is a wireless communication technology that can “talk” to and “listen” for similarly equipped vehicles, people, and traffic management infrastructure such as traffic lights to relay important information and help make city mobility safer and less congested. Planned alongside the rapidly building 5G cellular network, C-V2X enables direct communication between the connected devices, meaning a signal doesn’t need to first travel to a cellular tower, allowing vehicles to quickly send and receive information. Ultimately, it lets drivers know what’s ahead of them even before they have to encounter it, according to Butler. Vehicles also could communicate with traffic signals, alerting drivers when a light is about to change. Ford could take things even further, Butler wrote. C-V2X could be integrated with driver aids, like those in Ford’s recently introduced Co-Pilot360 suite. Or it could be added to self-driving cars. Emergency vehicles could be equipped with C-V2X transmitters, allowing cars to detect their presence and move out of the way. With plans to roll out 5G cellular networks underway, Butler writes, C-V2X can complement the sensors of self-driving cars. While these vehicles will be fully capable of operating without C-V2X, the technology could add to its comprehensive view from the LiDAR, radar and camera sensors. For instance, if emergency vehicles were equipped with C-V2X transmitters, they could notify self-driving vehicles that may be on their route so the vehicles pull over or reroute in plenty of time. Self-driving vehicles could even get real-time updates on road conditions that affect their routes.